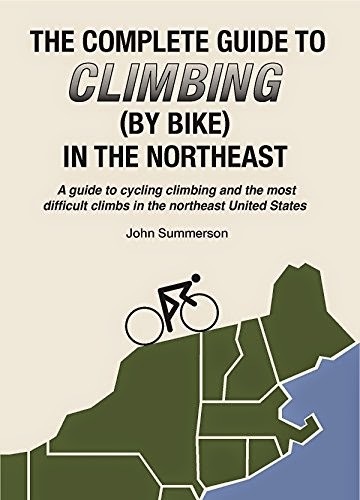 A few readers may be familiar with John Summerson's series of books titled "The Complete Guide to Climbing (by bike)." First in the series featured the 100 toughest climbs in the United States. Several New England climbs made the selection. Since that release, John has published other regional guides, such as California, Colorado and the southeast. "Isolated Kingsley Hill Road, located in northwestern Massachusetts, is a severe and unique ascent on a very narrow road. The first half mile of this one is simply the steepest I have found in the continental United States. Don't blink in the small town of Monroe Bridge or you will miss the turnoff. The rough surface adds to the difficulty along with a significant stretch of 20+% grade. If you survive the first half mile, keep going as the first mile of Kingsley Hill Road is also one of the steepest around." "Crux stretch - The first half mile, which may be the steepest of this length in the United States, could end up terminating your attempt at this hill." Yep, I've seen young studs have to put a foot down on that one. Many more details are provided on the Kingsley climb, as well as every climb covered in the book. Over the years, cyclists familiar with my website, Northeastcycling.com, have suggested I publish a guidebook. That effort seemed daunting to me. They'd say "but Doug, you already have all the content." Well, maybe not enough to fill a book. I don't know the first thing about publishing, and my day job eats up well more than 40 hours of my week the way it is. Publishing a niche book like this would have been a break-even proposition for me at best. It would have been a labor of love, just like my website was when I was regularly adding content. But now John has published a quite comprehensive guide to all the climbs we love, and even a few in my neck of the woods I hadn't heard of. He did his research and used first-hand knowledge for nearly every climb featured. Look for a copy on Amazon (says temporarily out of stock, but John assures me they have them). I have a couple copies, Order yours today. At some point I will retire my website. It has grown stale due to lack of regular upkeep. If I were retired, I'd keep it going. My investment of time in Northeastcycling.com has paid back dividends many fold. I've met some of my best friends through the website. I've enjoyed private email dialog resulting from the website with hundreds of hillclimb enthusiasts over the years. But the cyber landscape has evolved in the 17 years since I first stated a web page. Facebook and Strava vie for and capture much of our attention these days. Blogs have pretty much fallen by the wayside too. So now we carve out our little space with a billion others in these media. We picked a dubious weather week for some road cycling in Brevard, NC. Heading down last Saturday, there was high probability of rain every day Monday through Friday. At least it wouldn't be cold like it was in 2012 when I last came down here. That trip saw flurries some mornings, and the Blue Ridge Parkway was closed due to wintry conditions. The Parkway provides some of the finest early season riding in the southeast. Tourism season doesn't ramp up until May, so the Parkway is essentially a ridge top bike path. Now just if the weather would cooperate enough to let us complete some big loops without getting drenched or electrocuted. After building the bikes up Saturday, Brett and I were able to squeeze in a classic loop that is the core of an organized ride called "Assault of the Carolina's." It passes over Caesar's Head in South Carolina, the state's highest point. The 51mi, 5100ft loop did some damage. It was a bit more than a bike "shakedown" ride. Sunday was the only 0% chance precip day of trip. We had to go long. Tom arrived late the night before, so three of us headed out from the house. The planned route was another classic, the 215/276 loop which entails two major climbs up to and over the Parkway. 90+ miles and 8000ft of climbing. Unfortunately, a portion of the Parkway between 215 and 276 is being worked on and closed, precluding other route options that traverse this scenic section. That climb back up to the house? Brett cramped up horrifically approaching it, and I nearly had to push my bike up the 19%. I did not bring a compact crank but did have a 32t cassette on back. Oh boy, the rides are going to get more interesting as the trip progresses. The next couple days we did shorter, closer to the house rides due to high threat of rain and storms. The rides averaged about 50 miles and over 5000ft of climbing. Not what we hoped for, but none of us are really into riding in the rain with the extra bike maintenance it entails. Shorter does not mean easy. It means you can go harder. Wednesday's weather looked promising for a longer, higher elevation ride. Brett really wanted to give Mt Mitchell a go, via the Parkway from Asheville. This ride would require a short drive to the start. This was on my bucket list too, as the last three trips for me this ride was impossible. 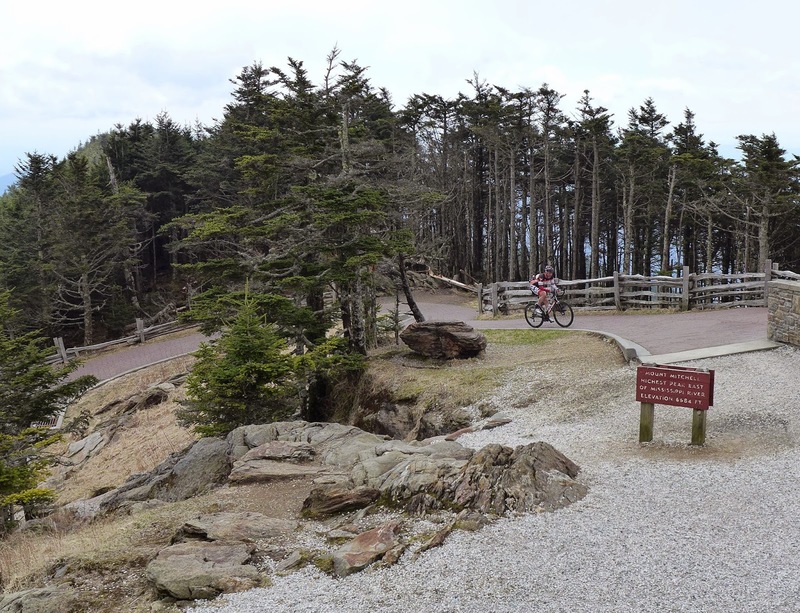 Two of the years the Parkway leading up to Mt Mitchell was closed due to a land slide. In 2012, it was snowed in. No risk of that on Wednesday. Temp in Asheville was expected to break 80F. There was risk of afternoon storms though. I wouldn't want to get caught up there in the storms that moved through here the afternoon before. Tom headed off to Charlotte area to see friends, so it was just Brett and I. Our pace was pathetic. I think I lost my roadie legs this winter. You'd think a week of big vertical on the MTB in Arizona a few weeks ago would have given me a boost, but you'd never notice. Wow, was I tired. Tourist pace it was going to be. We started out below the fog deck, dark, misty and dreary. A thousand feet of climbing brought us to mostly blue, sunny skies. It was very humid but not yet too warm. The Parkway was deserted. A car would go by every 15 minutes or so. It was just the wind and our heavy breathing breaking the silence. Turning off the Parkway onto the Mitchell summit road, the headwind was fierce. It was getting noticeably colder too, borderline needing layers even climbing. The summit was in and out of the clouds. Seems the previous two times I've climbed Mitchell via a different route, views from the summit were fickle. The summit area was nearly deserted, the shops not yet open for the season. No water either, so I was very glad I took a third water bottle up in jersey pocket. We poached the footpath to the observation deck. The summit was in the clear! After quick obligatory summit photos, it was time to zip on the shells and rocket back to town before any weather materialized. The decent rocked! There's a section that drops nearly monotonically 3000ft without need to scrub speed by braking. There are three short tunnels on this section. Brett and I agreed this was one of the best descents we've hit in the greater Asheville/Brevard area. It was a great way to end a 68mi, 7400ft day. We have two more days of riding left. Friday looks like complete washout, but we've had other days look this way and turn out ok. We may go for broke on Thursday and do another big one. I'll leave you with a few photos from the Mitchell ride. At 3200ft on the BRP, about 1000ft above Asheville. Just above fog deck. Brett clearing one of three tunnels on this section of the BRP. Around 5500ft. Mt Mitchell in distance just off Brett's forearms, completely socked in. Neat trees with fungus at around 5500ft on Parkway. View south from summit deck. At times clouds obscured view. The obligatory pose. Had the summit to ourselves for several minutes. On descent, looking back at one of the tunnels. Definitely a wilderness feel here, even on a road bike.